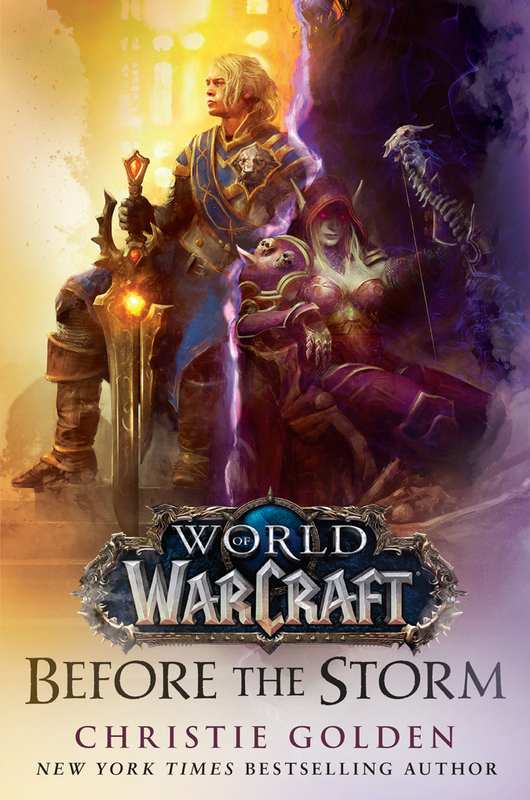 Before the Storm, the new World of Warcraft novel from Christie Golden, releases next week — but we have an exclusive excerpt to tide you over until then. The Horde and Alliance may have defeated the Burning Legion, but it wasn’t without its costs. Azeroth is dying, and the grievous wound the world suffered has revealed a new substance called Azerite. 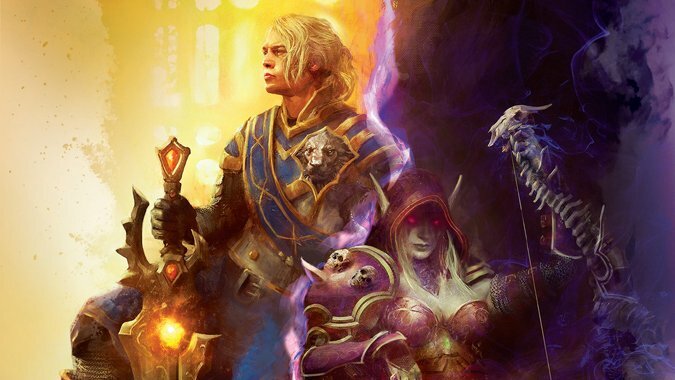 As the Alliance and Horde race to uncover Azerite’s secrets and heal the world, King Anduin Wrynn enacts a plan that may forge a lasting peace between factions — that is, if Horde Warchief Sylvanas Windrunner cooperates. Before the Storm hits the shelves next Tuesday, June 12. You can preorder your copy right now in hardcover or for the Kindle via Amazon. But hey — while you’re not-so-patiently waiting for next week, enjoy the exclusive excerpt from Del Rey Books below. Anduin stepped through a portal into a realm of wonder so beautiful, so Light-filled, his heart seemed to break even as it swelled with joy. He had spent much time in the Exodar and was accustomed to the soothing purple light and the sense of peace that pervaded the place. But this . . . this had the Exodar’s essence writ large, but with a different touch. The massive carved statues of draenei should have been intimidating, towering over visitors as they did. Instead, they felt like protective, benevolent presences. The melodic sound of flowing water came from both sides of the ramp that Anduin descended; sparks of light floated up gently, as if created by the soft splashing. He took a deep breath of the clean, sweet air as if he’d never truly expanded his lungs before. Farther into the temple, down the long, gentle incline, was a cluster of people. He knew who they were, or rather, what they represented, and the knowledge filled him with quiet anticipatory joy. Velen laid a hand on the king’s shoulder, as he had done so many times over the last years, and smiled. “Priests just like us,” Moira finished. She gestured to the various individuals milling around them. Among their number Anduin saw not only humans, gnomes, dwarves, draenei, and worgen—those who would be at home in Stormwind’s Cathedral of Light—but also night elves, who worshipped their moon goddess, Elune; tauren, who followed their sun god, An’she; and . . .
“Forsaken,” he whispered as the hair along his arms and the back of his neck lifted. One of them stood, her stooped back toward him, cheerfully talking with a draenei and a dwarf. There was another group heading toward one of the hall’s alcoves, carefully bearing piles of no doubt ancient tomes. This one consisted of a Forsaken, a night elf, and a worgen. Words would not come. Anduin found himself staring openly, hardly daring to blink lest it all turn out to be a dream. In Azeroth, these groups would be killing one another—or, at the very least, they would be suspicious, hate-filled, and fearful. The musical sound of a night elf’s throaty laugh wafted to him. “We are priests before all else,” came a voice. It was masculine, warm, and jovial, though it had a peculiar timbre to it, and as Anduin turned, he fully expected to greet a human priest of the Light. He found himself face-to-face with a Forsaken. The Forsaken’s eyes glowed an eerie yellow. They couldn’t possibly twinkle with amusement as a living man’s would, but somehow they did. Oh, yes, those undead eyes were twinkling. Anduin gave up any hope of behaving in a typically regal manner here. We are priests before all else, the undead being had told him, and he discovered it was a relief to put away the burden of royalty at least temporarily. He smiled and bowed. Anduin was utterly sincere. He’d pored through all the thick tomes about the benevolent, Greatfather Winter–like priest. The words on those pages painted a picture of a man who was quick to laugh but stood as strong as stone. Historians, usually content with simply recording dry facts, had waxed eloquent about Faol’s warmth and kindliness. Portraits depicted him as a short, stout man with a bushy white beard. The undead being who stood before the king of Stormwind was shorter than average but otherwise unrecognizable. The beard was gone. Cut? Rotted away? And the hair was dark with dried blood and ichor. He smelled like old vellum: dusty but not unpleasant. Faol had died when Anduin was a child, and the boy had never gotten to meet him. Anduin chuckled. He felt a familiar, welcome warmth in his chest as he looked around, trying to be more evaluating in his assessment of the place. Could this be a template for the future? Surely if gnome and tauren, human and blood elf, Forsaken and dwarf, could bond together for the common good, this could be re-created on a larger scale on Azeroth. The problem was that the priests, at least, had a common point they all agreed on even if each saw the Light through a different lens, as it were. “There is another notable person I think you’d like to meet,” Faol said to Anduin. “She, too, is from Lordaeron. But do not fear; she yet breathes, though she faced many dangers with courage and the Light’s aid. Come here, my dear.” His voice grew fond as he beckoned to a smiling blonde woman. She stepped forward, taking the archbishop’s desiccated hand without hesitation, then turned to regard Anduin. From the forthcoming book WORLD OF WARCRAFT: BEFORE THE STORM by Christie Golden. Copyright © 2018 by Blizzard Entertainment, Inc. Reprinted by arrangement with Del Rey Books, an imprint of Random House, a division of Penguin Random House LLC. All rights reserved.